COLUMBUS, OH--(Marketwired - Mar 30, 2016) - It's not too late to get Girl Scout Cookies -- at least not at the Renaissance Columbus Downtown Hotel. Partnering with Girl Scouts from East Columbus, Hilliard, New Albany and Dublin, the downtown Columbus hotel will serve guests, downtown workers and city residents Girl Scout cookies, milk shooters and petite Girl Scout cookie ice cream cones. On Tuesday, April 5th from 5:30 to 6:30 p.m., the hotel in downtown Columbus, Ohio, will host the Community Girl Scout Cookie Social Hour, serving 100 boxes of Girl Scout cookies in the lobby, and delivering cookies to guests in their rooms. Not only can locals and guests savor the delicious Girl Scout Cookie varieties, they can also mingle in the intimate seating spaces throughout the lobby. The hotel will also provide special wine pairings selected to bring out the robust flavors in both the wine and the cookie. Pairings include: Trefoils with 'ABC' Au Bon Climat Chardonnay, Thin Mints with 'If You See Kay' Red Blend, Samoas with Alberdi Rioja and Tagalongs with 'Lunatic' Red Blend. After the cookies, shooters, wine and cones, guests can continue to enjoy themselves with dinner at Latitude 41 or a drink at the chic and vibrant Bar 41, both found within the hotel. Who says dessert first will spoil your appetite? This is the ninth year the Renaissance Columbus has partnered with local Girl Scouts. But which Girl Scout Cookie is the most popular? In the annual poll amongst frequent hotel business travelers, Thin Mints and Samoas topped the list as the favorite Girl Scout Cookies. Look for these, and other favorite flavors, at the hotel. Relax in over 400 luxurious hotel rooms with upscale amenities and contemporary styling while enjoying stunning views of downtown. During your stay, explore top attractions from this Columbus hotel near Nationwide Arena, Columbus Convention Center, and The Ohio State University. Feel the energy of the state's capital at the Renaissance Columbus Downtown Hotel. 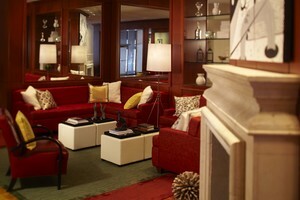 For more information, visit http://www.marriott.com/hotels/travel/cmhbr-renaissance-columbus-downtown-hotel/ or call 614.228.5050.